This was a SUPER busy week with our "Meet The Teacher" on Monday. I met all 18 of my new MonSTARS and let me tell you, they are ADORABLE!! I loved every minute of it and was soooo happy that they loved their new classroom! There were several "this is the best classroom ever!" comments, and even one little girl who asked her mom if she could decorate her bedroom like our classroom. Melt.My.Heart! That is exactly why I spent all summer crafting it up - worth every minute! The next morning was the first day of school with my new little Mon-STARS! I am soooo lucky to have a wonderful student teacher this year. I don't know how I would have survived the first day of school "Painting Party" without her help!!! Yes, there was paint everywhere, spilled cereal from our pinterest-inspired snack, and a little chaos, but I think the children enjoyed it! And we now have cute, colorful canvases in the hall to display student work. Students colored their names which were attached to clothespins to hold their work. I definitely hope to post more this coming week, but I do have a meeting 4 out of 5 days (The first full week of school??? Yep!) 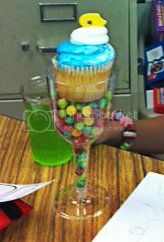 But hey, maybe I can multi-task during the Office inservice! 1) I have been a bad blogger for the past few weeks! I keep reading them, but I haven't been able to summon to energy to write my own! 3) Your husband rocks. What a fun way to give gifts! 4) Your mon-star wall is AMAZING! Glad you had such a great first week! I absolutely love the monster paintings! They are precious! Oh yes....and Happy "late" Birthday! Sounds like it was a wonderful day...:) What a sweetheart! Your classroom is definitely the best one ever! I would want to stay there all day. It's no wonder that girl wanted her bedroom like your classroom. Every time I go into Target and see those Monster water bottles I think of you. Wow you really have the best husband ever! Talk about love! Hope you had a wonderful birthday! Congrats on a great first day of school! Seems like you had such wonderful activities planned for them. The monster gallery turned out so adorable! Can't wait to hear more about your WBT and student teacher adventures. Be sure to check out my new blog! I am planning my first ever freebie tomorrow! I totally am on your side about finding balance with blogging and work. Seems like the beginning year there so much to do, even when you have prepared ahead of time during the Summer. I can't wait to get back to my normal routine where I don't get stuck after school until 6pm. Good luck with next week, and happy belated birthday! OMG, 37 gifts? GREATNESS!! Happy Bday. Did you outline the monsters on the canvas and have the kids paint them - or did they just freestyle paint? I was thinking about WBT, even watched the videos. But, I decided against it. My kids rotate between 3 of us throughout the day and I was the only one wanting to do WBT (the only one who had heard about it in fact) so in the name of "teamwork", I'm going to use the same ol' rules. Maybe next year I can convince my principal to look into it. There is nothing worse than an inservice that doesn't apply to you or your classroom. I must show my hubby this post. 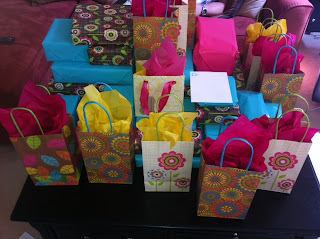 My bday was on the 20th and getting 36 presents would have been nice! 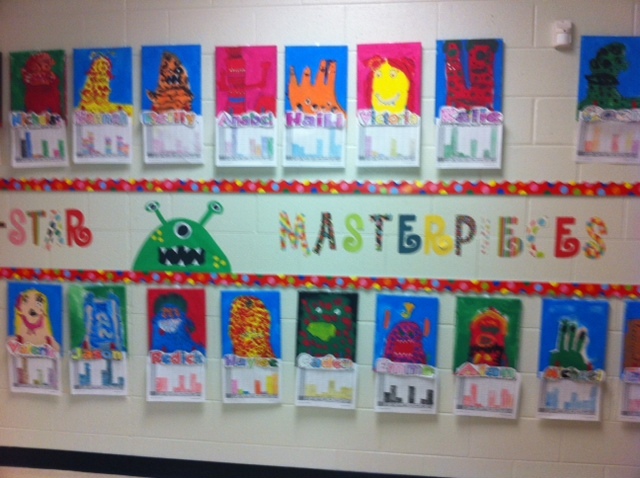 Those monsters paintings are fabulous!!!! What a sweet husband. Love your mon-star pics, paintings, and snacks. I was struggling this past week with the balance also. It is so hard to go from so much free time to SUPER busy! I've been bad too so don't feel guilty. I think we're all adjusting to the new routine. I finally posted pics of my class today. I love how the artwork turned out, too! The kids drew their own monsters with a pencil on the canvas first. Then they painted them. The only paintbrushes I had were the "chubby" kid brushes, and the monsters were lacking detail. So, once they dried, I let them outline and add details to the paintings wish Sharpies. Love the monsters! Happy belated birthday. 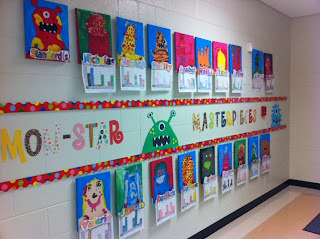 Love the "Mon Stars" canvases and the hall display! It is amazing! Enjoy the start of your year and thanks for sharing your passion and creativity with all of us! Happy Late Birthday!!! 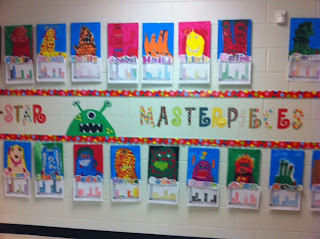 I love the monster paintings!!!! !